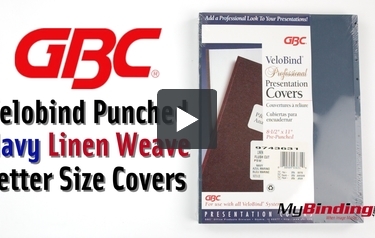 Add a classic, elegant finish to any presentation with these genuine Velobind punched navy linen weave paper covers with windows from GBC. Donning the refined look of linen, these navy letter size covers are made from 50% recycled material. Constructed from 80lb cover stock, the 8.5" x 11" navy covers work perfectly with any binding system (see list below). These particular navy letter size paper covers come pre-punched for use with Velobind binding systems. Additionally, these GBC 8.5" x 11" covers are perfect for use with foil stamping or offset printing. Our letter size navy GBC linen weave covers come in sets of 25 and are designated with the part number 9742451G.